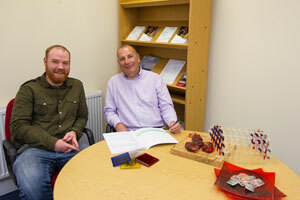 Business Gateway Fife (BGF) has opened a hub office in Cupar supporting our operations across Fife. From our new hub, BGF have already advised our first client – East Neuk Glass. The bespoke stained glass design business was seeking Create in Fife funding to help with the purchase of equipment, including a kiln. The Create in Fife Fund provides financial support (50% contribution up to a maximum of £1,500) to creative businesses on a range of projects as well as help with the purchase of capital equipment. BGF’s Cupar hub is located at Westport Business Centre, Old School Road and is an additional part-time office, with headquarters based in Glenrothes. Westport Business Centre comprises of five units, of which three are available for lease, following a recent refurbishment by Fife Council. BGF’s Cupar office will be open two afternoons a week. To contact BGF’s advisers outwith these times please call 01592 858333.